Twelve people, 10 journalists and two policemen, have been killed, and 10 others wounded in the shooting massacre at the Paris headquarters of satirical newspaper Charlie Hebdo. Three of the wounded are in critical condition. The hooded gunmen stormed the offices at 11.30 am Paris time (10.30 am GMT), reportedly having forced a staff member to open the door at gunpoint. “They shot Wolinski, Cabu… it lasted about five minutes… I took cover under a desk… they spoke perfect French… they said they were Al-Qaida,” cartoonist Corine Rey, aka “Coco”, was quoted as saying by the weekly Humanité. The woman told the paper she was the one who let the men inside, with them pointing a gun at her. A witness, Benoit Bringer, told TV station iTELE two black-hooded men were seen entering the building with Kalashnikovs rifles, with "lots of shots" being heard a few minutes later. One of the men was captured on video shouting "Allah!" as four shots rang out, Reuters reported. Two assailants were then seen leaving the scene, and exchanging fire with police officers, killing one, before fleeing in a car towards the eastern Paris suburbs. 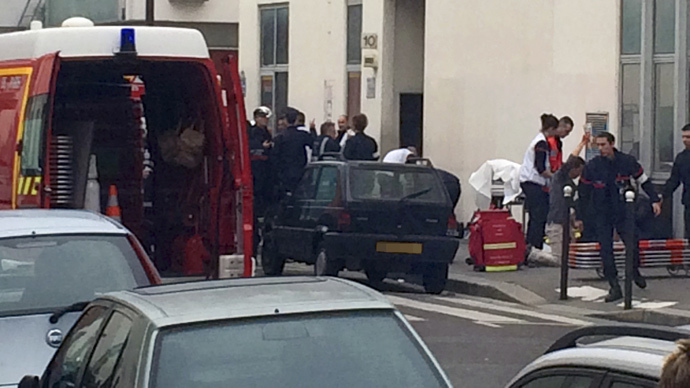 The car was later found in the nearby 19th district, in northeastern Paris. The attackers are still on the run. French President Francois Hollande arrived at the scene of the shooting, and will shortly hold an emergency government meeting, according to Reuters, citing a source at the president’s office. The numbers of victims is likely to rise, the French president added. Flags across France have been lowered in mourning for victims of the attack, according to reports. Hollande also stated that "several terrorist attacks have been prevented in recent weeks." Security levels in Paris have been stepped up. Amchai Stein, the deputy editor of Israeli IBA Channel 1, has been posting photos from the scene of the shooting. About thirty shots were fired, according to Reuters. According to some sources, there were three armed men involved in the shooting. France's top security official later confirmed three gunmen carried out the deadly attack on the French paper, AFP reported. "It's a massacre. There are dead!" an employee of the newspaper told French media outlet 20minutes, and then the call disconnected. A manhunt is currently underway in Paris, Le Point reported, with the anti-crime brigade (BAC) chasing two armed men in the eleventh district of Paris. The attack has been condemned at the highest levels internationally. In a White House statement, the US said it condemned the shooting in the “strongest possible terms," adding that its senior officials "have been in close touch with their counterparts in France" and were ready to "help them probe the attack." President Vladimir Putin has expressed condolences to his French counterpart Francois Hollande and passed his words of sympathy to the families and friends of the attack's victims, the Kremlin's press-service reported. There is never a justification for terrorism and we must unite and cooperate in the fight against it, presidential Press Secretary Dmitry Peskov told RIA Novosti. German Chancellor Angela Merkel named the act an attack not only on people lives, but also "on freedom of speech and the press, core elements of our free democratic culture." The Muslim Council has also condemned the attack as a "barbaric act" against "democracy," according to Le Monde. Charlie Hebdo (Charlie Weekly) is a controversial French satirical newspaper that came under attack over the publication of caricatures of Muslim leaders and the Prophet Mohammed in 2011. The attack in the newspaper offices - as yet unclaimed - is the worst militant attack in recent decades in France, which has a five-million-strong Muslim population - Europe's largest. In December, at least 10 people were injured, two gravely, as a minivan crashed into a Christmas market in Nantes. The driver was allegedly shouting "Allahu Akbar" ("God is greatest"). French officials said several other attacks have been prevented in the country in recent weeks. In the mid 1990s, the Algerian Armed Islamic Group (GIA) carried out a series of attacks in Paris, including the bombing of a commuter train in 1995, which killed eight people and injured 150.